MONTGOMERY, AL--(Marketwire - October 1, 2010) - Through a partnership with the City of Montgomery and the Montgomery Renaissance Hotel and Spa at the Convention Center, Mayor Todd Strange and Alabama Black Belt Adventures announced the first in a series of Food and Wine Experiences to be held in Montgomery. The inaugural event -- to be hosted at the Montgomery Renaissance Hotel and Spa on Thursday, October 14th -- will begin with a welcome reception at 6:30 p.m. with the main presentation to be held from 7:00 to 9:00 p.m. The Montgomery Renaissance Hotel's Executive Chef, John Melton, will be preparing a three-course meal featuring wild game that is prevalent throughout Alabama's Black Belt region. Participants will have the luxury of seeing firsthand on large projector screens preparation of each of the wild game, such as pan seared dove breasts, cranberry-pecan stuffed quail, and pumpkin cheesecake. Those in attendance will also get to enjoy each dish as Chef Melton prepares it, along with wines paired with each course. "We are thrilled to announce this new series of Food & Wine Experiences that we hope will generate a great influx of tourists from all across the country, as well as draw attention to the great attractions we have here in Montgomery and Alabama's Black Belt," said Alabama Black Belt Adventures project manager, Pam Swanner. "To feature these events at the world-class Montgomery Renaissance with Chef Melton is something we're hoping will continue to attract interest and buzz about what we have to offer in this region." Clay Fritz of California winery, Fritz Wineries, will be present to discuss the wines being paired with the wild game dishes that will be prepared. Those in attendance will also have the option to purchase the wine featured during the evening at the conclusion of the event. The second Food & Wine Experience will be held on Tuesday, November 9th and will feature a new menu, along with wine pairings from Alexander Valley Vineyards in Sonoma California. The room for the event will be set up similar to the set of "Iron Chef" with seating elevated on risers to increase visibility. Seating is limited to 50 tickets at $125 per person. Tickets are available at the Renaissance Montgomery box office, as well as online at Ticketmaster (http://www.ticketmaster.com/event/20004531C5262A85), by phone or at other Ticketmaster box offices. The Renaissance Montgomery is offering a Food & Wine Experience package with a deluxe guest room and two tickets for $379. To reserve the hotel package or to learn more about lodging in Montgomery, AL, call 1-877-545-0311. "This is going to offer a new experience for the outdoor enthusiasts that we're constantly targeting to visit this region of our state," said Pam Swanner. "There are numerous accommodation packages, including the spa facilities, being offered at the Montgomery Renaissance that are attractive to both the hunter and non-hunter. The goal is to provide a true destination weekend adventure." Alabama Black Belt Adventures is committed to promoting and enhancing outdoor recreation and tourism opportunities in the Black Belt in a manner that provides economic and ecological benefits to the region and its citizens. For more information, please visit: www.alabamablackbeltadventures.com. Part of the Robert Trent Jones Golf Trail's Resort Collection, the Renaissance Montgomery opened downtown in 2008. The luxurious hotel near Maxwell Air Force Base features 346 upscale guest rooms, including 27 suites, with many overlooking the Alabama River. A world-class spa, performing arts centre and convention center are part of the Renaissance Montgomery. Learn more about the hotel's restaurants in Montgomery, Alabama online at www.renaissancemontgomery.com. 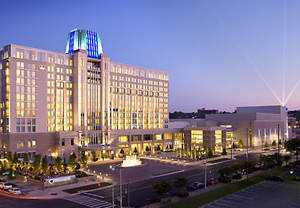 The Renaissance Montgomery Hotel & Spa at the Convention Center, destined to become the South's premier convention hotel, shines brightly in the capital city.